July 9th had been circled on our calendar for over 2 months. We knew the day was coming. 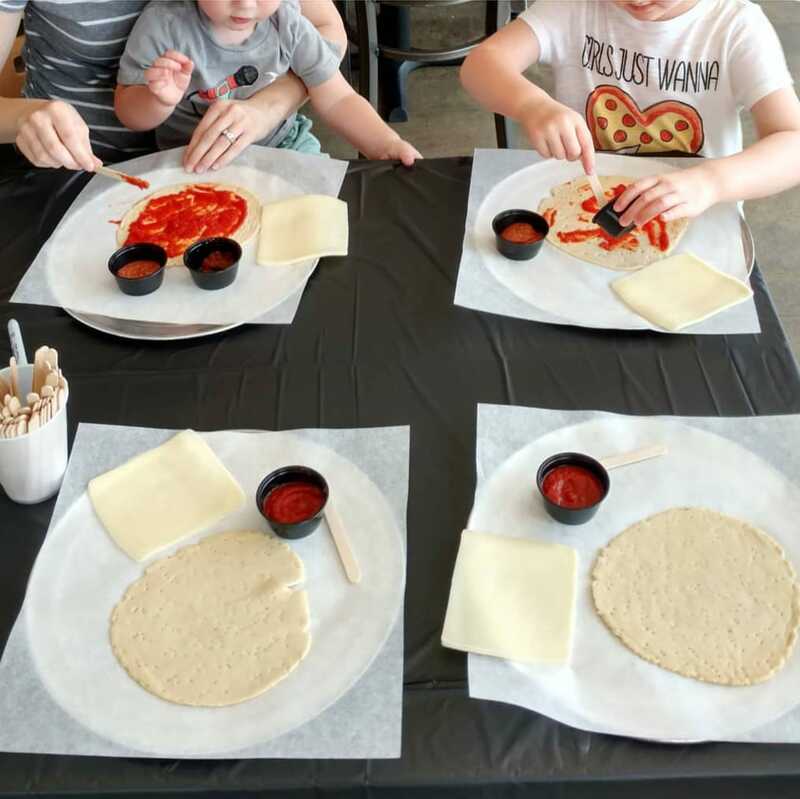 July 9th was the day we had planned to do “Kids Make Their Own Pizza Day” in Evansville and Newburgh. 3 stores, all during one 3 hour lunch rush. It feels like I have been preparing my whole life for this one day. One chance to make an impact on the lives of hundreds of kids. Woah. No pressure. And it was a blast!! I worked at the Westside Evansville Azzip along with Zack, Heidi, and my teacher cousin Jenna. There were 4 of us plus our normal awesome Westside team at the store to shepherd the 150 kids or so through the process of saucing, cheesing and adding meat to their pizza. We were all that stood between order and chaos. And we succeeded! We got to meet a ton of awesome families and kids. So lets back up a little bit. When the idea for Azzip was first conceived, I had no idea we would become the type of family restaurant we have become. When I thought personal pizzas, I thought young adults and people on their lunch break. I didn’t quite realize the power of everyone in the family getting their own pizza made exactly how they wanted. Using that info, we have invested a lot of time and effort to try and make the experience special for our smallest guests. The kids meal has been tweaked over time from a larger pizza cut in half, to a special size for the kids meal. We’ve added a custom printed Azzip kids cup. And just recently we have debuted a special run of stickers available for kids on their trip to Azzip. 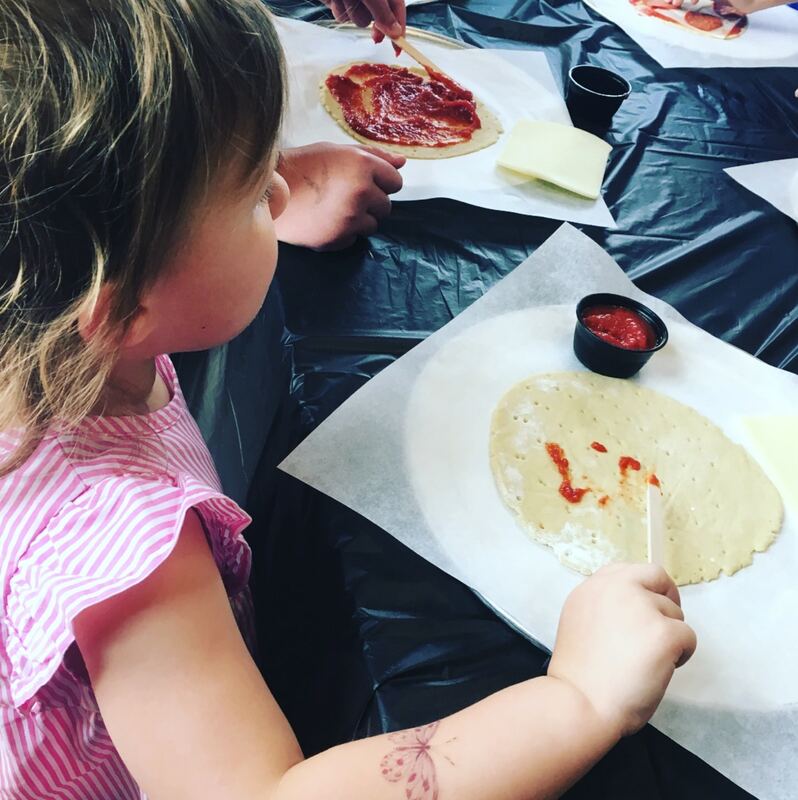 Everything from focusing on communicating directly with the kids to drawing smiley faces with the red sauce helps us provide a memorable experience every day for kids in our stores, but we wanted to take it a step further. Cue the Kid’s Build Their Own Pizza Days. My cousin Jenna’s 2nd grade class has been coming to Azzip for 5 years now and we have always gotten such positive feedback from her on how much fun the kids have. Their field trip to Azzip has become a right of passage for her class at WCS. We have used the format we developed with her class and have hosted Kid’s Days at stores in Bowling Green, Bloomington, Terre Haute, and Lafayette, but we have always been scared to do one in Evansville because we didn’t have a strong plan to be able to serve the number of kids we expected. 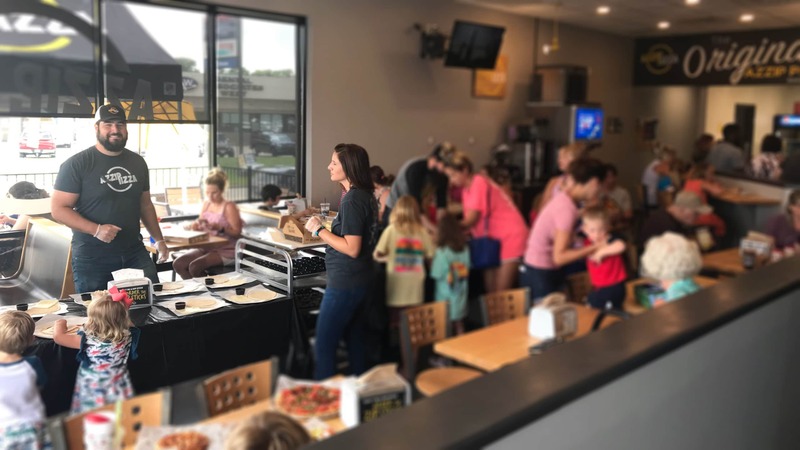 But after a few times hosting at other stores, and seeing the smiles it brought kids there, we felt the time was right to bring it back to Evansville. You could say it was a major success! We had a ton of fun helping the almost 500 kids build their own pizzas. We saw a lot of smiling faces as kids put together their own pizza. Moms and Dads, Grandmas and Grandpas, had something fun to take the kids to. 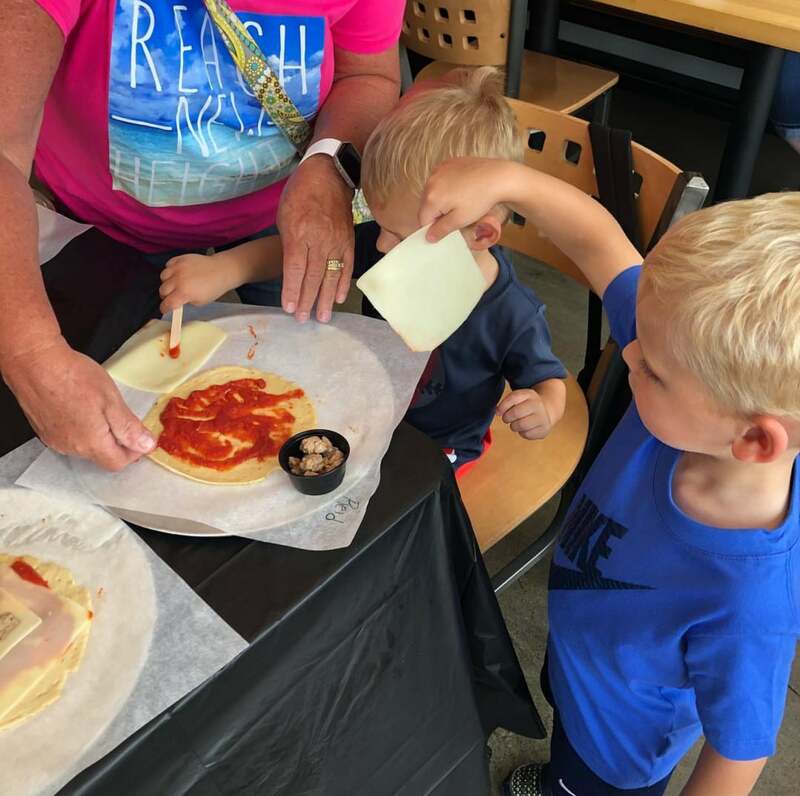 The kids got a free pizza with every adult pizza purchase, and it was well worth it to see all the smiling faces at Azzip. So thank you to everyone who helped make it possible. Thanks to all the teams in our stores for being all in on giving our fans a great experience. Thanks to all the home office staff who spent the day in the stores helping organize and execute the day. And thanks to all of you who came out and had fun with the kids at Azzip. It means so much to us to have all the support we do from you. Special thanks to Heidi Musser, Brittany Houck, Ashley Devillez, and Heather Harper for sharing your photos with us!